I enjoyed Sarah Miller’s historical fiction Caroline (about Caroline Ingalls of Little House fame) so much, I decided to check out a book from her backlist: Miss Spitfire: Reaching Helen Keller (athenaeum Books for Young Readers, 2007). 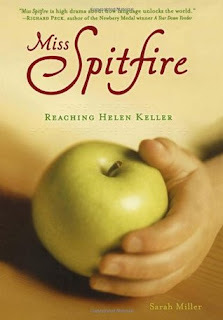 This novel tells the story of Annie Sullivan, Helen Keller’s teacher, from the time she leaves Perkins Institute for the Blind to the point young Helen’s mind finally makes the connection between words and meaning (with some flashbacks to pivotal moments earlier in Annie's life). This work of historical fiction is primarily based on the letters Anne wrote to her housemother at Perkins as well as a biography of Anne written by a close friend. It is interesting to experience the well-known story through Annie’s eyes. Ultimately, it is a story of a teacher trying to reach a student facing huge obstacles. As I read it, I reflected on the methods Annie used, some of which would likely be considered abusive today. Annie’s purpose was always to educate, not to harm, and we shouldn’t judge someone of a different time by our own standards, but I still didn’t know what to make of these methods. Clearly, they worked. How would the same story have played out today? Helen probably would have had some early intervention to help her from the time she was a small child so that she wouldn’t have been such a wild young girl. Would she have made as much progress using different methods? These are all moot questions, yet Miss Spitfire does inspire much debate about methods of special education. While it is billed as a book for young readers, it makes for excellent reading for older children, teens, and adults.